MPs will be able to have a final vote on the Brexit deal by 12 March, Prime Minister Theresa May has said. 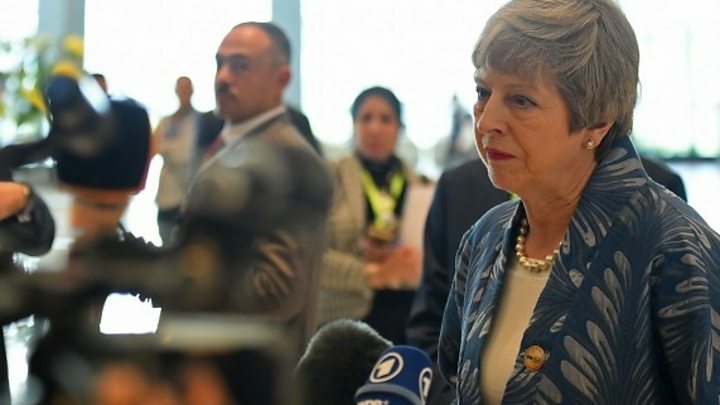 Speaking as she travelled to an EU-Arab League summit in Egypt, Mrs May ruled out holding a so-called “meaningful vote” on her deal this week. But she said “positive” talks with the EU were “still ongoing” and leaving on 29 March was “within our grasp”. Labour leader Jeremy Corbyn accused the prime minister of “recklessly running down the clock”. In a tweet, he said the move was intended to “force MPs to choose between her bad deal and a disastrous no deal”. Labour, he said, would “work with MPs across the Commons to prevent no deal, break the deadlock and build support for our alternative plan”. On the plane to Sharm el-Sheikh for a summit between EU and Arab league leaders, Mrs May said her team would be returning to the Belgian capital on Tuesday for further talks. “As a result of that, we won’t bring a meaningful vote to Parliament this week, but we will ensure that that happens by 12 March,” she added. Mrs May has already met European Council President Donald Tusk for talks after landing in Egypt and will meet other EU leaders on the fringes of the summit later. She said negotiations were continuing over the backstop – the controversial policy that aims to prevent a hard border returning to the island of Ireland – after Parliament voted for her to seek “alternative arrangements” to what is set out in her deal. Mrs May told reporters the government was “talking to the EU about various ways in which we can find a resolution to the issue that Parliament raised”. What does 12 March Brexit vote date tell us? It’s true that playing for time is a powerful, if cynical, political strategy and the Labour Party – and lots of Conservatives too – are annoyed that Downing Street seems to be dragging its feet like this and won’t give MPs a formal thumbs up or thumbs down vote for more than another fortnight. The prime minister naming the next vote day might do a little to calm the tempers of those in government who have been very publicly suggesting that strategy is madness. 12 March is at least, for them, before the next EU summit. It is not, as these things go, the final, final, moment. Reckless, many will suggest, but not a total kamikaze mission. But it won’t stop the senior MPs Yvette Cooper and Oliver Letwin, still pushing for a vote next week for their own bill that would force the government to delay Brexit if they don’t have a deal in place by… guess when? 13 March. Oh look – the day AFTER Number 10’s new deadline. Here, the date of 12 March suggests that the government is, as one source suggested, “planning for every eventuality”. In other words – they think it’s likely MPs might indeed vote this week to extend the process if a deal hasn’t been done. Labour’s Yvette Cooper – who has tabled an amendment this week to try and postpone Brexit if no deal is agreed in time – called the delay to the final vote “utterly shambolic”. “Each time she promises a new date. Each time she delays,” Ms Cooper tweeted. And the director general of the British Chambers of Commerce, Adam Marshall, said it was “unbelievable” to leave the vote so close to the planned exit date. A parliamentary vote on March 12th for something that’s meant to take effect on March 29th. Irish Foreign Minister Simon Coveney warned on Sunday that his government could not be asked to “compromise on something as fundamental as the peace process”, on which the border played a key part. 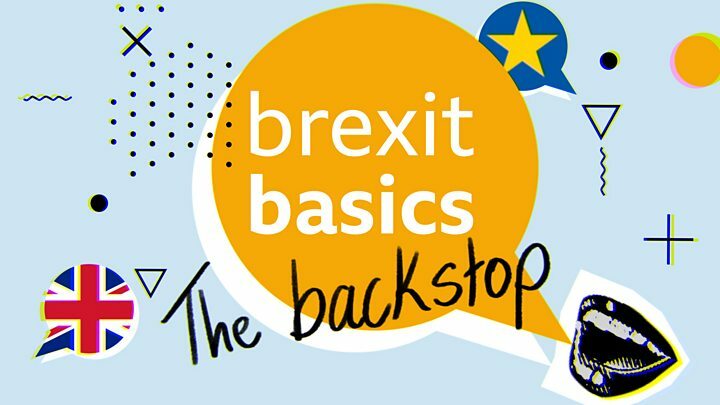 He accused the UK government of wanting to change the backstop to “placate a group in the Conservative Party who are insisting on moving the prime minister away from her own policies”, and reiterated that the EU would not re-open the withdrawal agreement. But he told Sky News they would try to “provide reassurance and clarification for the British Parliament to allow them to ratify this deal”. Speaking from the summit on Sunday, Austria’s Chancellor Sebastian Kurz said it “would be good to postpone Brexit” if the deal was not agreed by the beginning of March. Media captionConfused by Brexit jargon? Reality Check unpacks the basics. What votes are happening this week? On Wednesday, MPs will be able to put forward a range of amendments to show what direction they want Brexit to take. The Speaker, John Bercow, will then decide which ones the Commons can vote on. One amendment, tabled by Labour’s Ms Cooper and Conservative Sir Oliver Letwin, would give Parliament the opportunity to delay Brexit and prevent a no-deal situation if there is no agreement with the EU by the middle of March. Cabinet ministers Greg Clark, Amber Rudd and David Gauke wrote in the Daily Mail that they would be forced to back the amendment if the pro-Leave European Research Group (ERG) – made up of Tory backbenchers – stood in the way of the withdrawal deal being agreed “in the next few days”. The ERG would then have “no-one to blame but themselves for delaying Brexit,” the trio said. 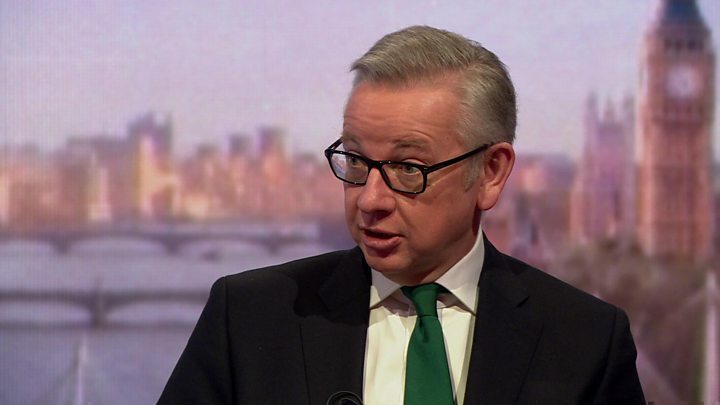 Earlier, Environment Secretary Michael Gove urged his cabinet colleagues against backing the amendment, telling the BBC’s Andrew Marr it would be the “wrong thing to do” and called for “unity” behind the PM. Mrs May said extending the process “doesn’t solve the problem”, adding: “Often people talk about the extension of Article 50 as if that will actually solve the issue. The prime minister said she would not be taking action against the three ministers and denied collective responsibility in cabinet had broken down. “What we have seen around the cabinet table, in the party, and in the country at large is strong views on the issue of Europe. That is not a surprise to anybody. “We have around the Cabinet table a collective, not just responsibility, but desire, to actually ensure that we leave the European Union with a deal. That’s what we’re working for and that’s what I’m working for,” Mrs May said. But the leader of the ERG, Jacob Rees-Mogg, told BBC Radio 5 Live’s Pienaar’s Politics that, for ministers, “the act of voting against the government is the act of resignation”. Meanwhile, senior Labour MPs have said they are “moving closer” to backing a second referendum. Another amendment has been tabled for Wednesday by Labour backbenchers Peter Kyle and Phil Wilson, calling for Mrs May’s deal to be put to a public vote. Labour’s deputy leader Tom Watson also told the BBC’s Andrew Marr programme that “we are heading in that direction” towards a further referendum, but “there is still more play in the days ahead”.